After my brief period of believing that there was no unique candy in Montreal , I was proven wrong â€“ with a vengeance. All it took was a trip to the shopping district of Rue St. Denis, a shopperâ€™s paradise of quirky little shops, restaurants and cafes â€“ and some great chocolatiers. One of those is Marius et Fanny Patisserie Provencale, which, despite the name, is a chocolatier as well. On the pastry side of things, they do a variety of cakes and cookies including some marvelously crisp-on-the-outside, tender-on-the-inside macaroons filled with a flavored ganache (and as they werenâ€™t technically candy, I had no qualms about devouring mine on the spot instead of bringing them home to write about later). Of their chocolates, I was most intrigued by their tiny tasting bars or â€œtablettes,â€ each about the size of a couple of fun-sized Kit Kats. The little bars came in a variety of intriguing flavors, including paprika and sun-dried tomato and basil (YES! I knew somebody had to be doing a sun-dried tomato chocolate bar after tasting this combo for the Great Chocolate Experiment). Eventually, I decided on lavender, a flavor Iâ€™d never tasted before. 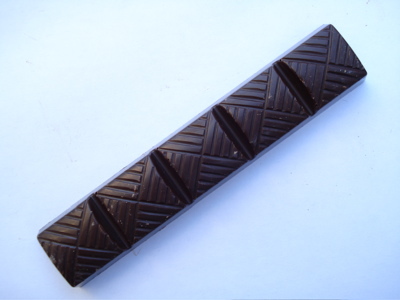 The little bar of dark chocolate is divided into five squares. The flat bottom (or would that be the top?) is sprinkled with dried lavender blossoms. It has a faintly herbal aroma on top of the scent of the chocolate. When I put the bar into my mouth, I get a whiff of floral, almost minty flavor, but itâ€™s quickly lost once I begin to chew up the piece. Iâ€™d thought the chocolate might contain some lavender oil or something in addition to the dried flowers on top, but if it does, itâ€™s very subtle. Maybe itâ€™s just that Iâ€™m not entirely clear on how lavender is supposed to taste, but Iâ€™m really having trouble detecting it. Itâ€™s good chocolate though, buttery and cooling on the tongue, not too bitter or too sweet with a bright, slightly acidic flavor. I wish I had some of their regular dark chocolate to compare this bar with. So is lavender and chocolate a good combination? Honestly, I canâ€™t really say. But Iâ€™d definitely go back to Marius et Fanny to try a few more flavors â€“ not to mention some more of those fabulous macaroons. Lavender, huh? Sounds interesting… but I have a feeling it will mean a hefty price tag. I like the idea of having tiny taster bars – I wish more places would do that! Laurie, I just had my first experience eating lavender, too. A friend just sent me an “herbes de provence” blend and I like the lavender component. It’s strong enough that you can tell which spice the lavender is, without being overwhelmed by the flavor. 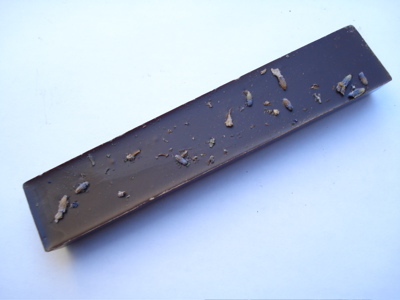 Maybe you could try it in one of your Great Chocolate Experiments. lavender in the words of a friend of mine when placed in food “it tastes like someone poured tide detergent with roses into my chocolate.” i don’t think i am that extreme, but it’s not a flavor i enjoy in food.